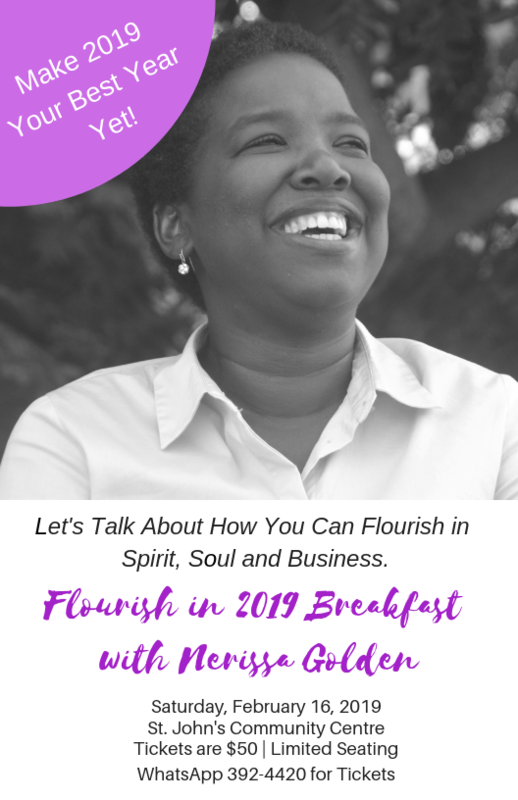 Author and business coach Nerissa Golden has announced she will be hosting a Flourish in 2019 Breakfast on Saturday, February 16, 2019 at the St. John’s Community Centre. “You don’t need to be an entrepreneur or even aspire to be. This is a morning to come and be refreshed as we talk about the things which often hinder us from growing and truly flourishing the way we most desire to,” shared the motivator. Golden, who also runs Discover Montserrat, said the breakfast is an opportunity to pour into people in the way she enjoys most. As she is a staunch advocate for people to start and operate successful businesses, the event includes a chance to brainstorm and work through some of the challenges that business owners may experience on the road to flourishing. Flourish in 2019 begins at 8AM to noon. Tickets are EC$50 and are available by contacting Golden via email at nerissa at trulycaribbean.net or online via her Facebook page. Seating is limited and preregistering is necessary.